I got this 1999 10th Anniversary Edition Miata when I was in college. I knew I wanted an NB with the 6-speed transmission, sport suspension, LSD, and (very rare on an NB, especially an NB1) ABS. Because I youthfully decided that the ABS and LSD combined with snow tires would make a fine year-round car in Wisconsin. The main distinguishing features of the 10th Anniversary Edition Miata are that it introduced the 6-speed manual transmission to the Miata, and it was otherwise a fully-loaded, very blue, 1999 Miata. ABS however, was an option, even on the 10AE. Blue carpets, blue alcantara + black leather seats, blue shift boot, blue accents on the shift knob and steering wheel, and blue gauge faces. It also had fake carbon fiber dash trim. Being a fan of the color blue, I appreciated all the blue, and it had such luxurious options as air conditioning, power seats and mirrors, and a Bose stereo. It had “four” speakers if you counted the separate woofers and tweeters in each door. 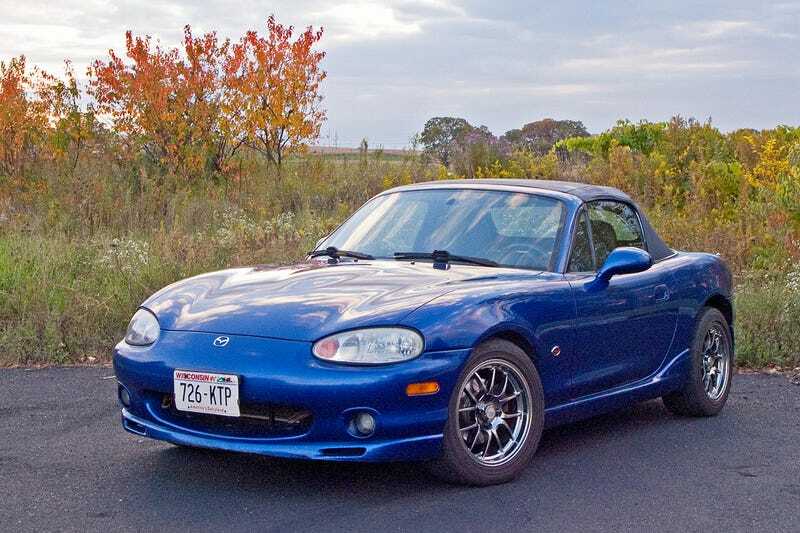 This picture I took in 2004 is still the example photo of the 10th Anniversary Edition in the Miata.net color gallery. My claim to fame, I suppose. Over the years, I kept it mostly stock, but I added 15x8” 949 Racing 6UL wheels with Hankook RS2s and Blizzaks on the stock wheels, cycled through assorted performance brake pads until I arrived at super dusty and squeaky Hawk HP+ along with ATE atom-shaped slotted brake rotors and stainless lines. The suspension was the stock sport package with Bilstein shocks, marginally stiffer springs and sway bars. I added Racing Beat rear sway bar end links because one of the stock ones broke, and had an aggressive alignment done, thanks to the NB being fully align-able from the factory. That was it. But boy was it fun. Eventually I felt like I needed something more practical in my life so in the summer of 2008 I put down a deposit on a then brand-new 2009 Honda Fit. I was going to have 2 cars, even though I was renting a room in my friend’s house, and spending an increasing amount of time over at my gf at the time’s place. Real smart. Eventually I said screw it, I want one car that’s got more practicality, backed out of the deposit on the fit, then went through a long drawn out process of almost buying a loaded 2009 RX-8 brand new at a significant discount, but then decided I didn’t want another rwd car in Wisconsin winters and ended up with a CPO 2006 Mazdaspeed 6. It didn’t stay stock either. I got rid of it in 2013 when I just couldn’t stand the interior rattles and rust problems anymore. Now you’ve seen the Mazda period in my vehicle history. I’m still a little salty about that MS6's rattly interior and rust problems. But when I look back, if I hadn’t gotten the MS6, I would’ve gotten an RX-8, and I’d probably be salty about that too, unless by some miracle I ended up with the world’s only reliable RX-8. Being the smart guy that I am, since getting rid of the MS6, I’ve had two turbo BMW coupes, and two Jeeps. Because those are both known for being super trouble free and reliable, of course. At the moment I only have one thoroughly modified, slightly impractical, not-the-best-mileage, awd car, and since I’m married now, I’ll probably be stuck with it for a while. The car. Maybe my wife too, but that’s up to her.